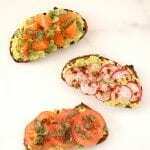 Mash up avocado and spread on slices of whole-grain bread. top toast with tomato and basil. drizzle with balsamic and sprinkle with sea salt and pepper. top toast with radishes and juice lime over top. top toast with orange slices and basil. drizzle with balsamic and sprinkle with sea salt. *ingredients for each flavor make 1 slice of toast – feel free to double or triple recipe for more servings.